From these nominations, a judging panel will choose five winners who will each receive $1,000 scholarships, and five additional finalists who will each receive $200 scholarships. The scholarships honor young people who take action to increase cross-cultural understanding and awareness in the community. These scholarships have been awarded every year since 1994. The Diversity Makes a Difference awards dinner will be held on Friday, March 28, at the New Hong Kong Restaurant. “I want to create a world where cultures are embraced, a melting pot where everyone is welcome,” wrote Abiel Zewolday. Abiel is a deacon at his church, mentors young teens, is actively involved in the Eritrean community, and is a marketing apprentice in the Bing division of Microsoft. “Abiel most definitely possesses the qualities that will help him navigate college life effectively,” said his high school principal, Miriam Mickelson. “Alexis is a high achiever with excellent grades and a wide range of extracurricular interests,” said her youth pastor, Nick Pringle. Last year, Alexis attended a mission trip to Yakima as a leader, taking 80 middle school students to help serve the community. Alyssa is a natural leader, said her Spanish teacher, Kieran McCormick. Amanda has also organized multiple service community projects, including food and toy drives. “I acknowledge the value of bringing these perspectives to the leadership positions I hold because I strive to address the needs and understand the circumstances of everyone in the group,” wrote Amanda. “It’s important for everyone to be unique and leave their mark on this Earth to distinguish themselves from others,” says Angela Geyer. Angela is the president of the Rotary-Interact Club, a member of HI-Q, a member of DECA, and a cheerleader. Thus begins the essay of this Highline High School sophomore — a young man who knows who he is. Last summer, Asosa participated in a community-based program called Our Future Matters, a coalition of Pacific Islander students and adult mentors whose mission is to help Pacific Islander students and their elders and leaders create positive change and enhance success in education. “I have seen AJ emerge as one of our student leaders and find his own voice as an advocate for diversity,” said his high school counseling intern Maile Kaneko. Ayesha Quadri has been a math tutor and was chosen to be a “Link Leader” for her 2013-14 school year, guiding freshmen through their transition into high school. In 2013, Courtney Gu became the first student representative on the City of Edmonds Arts Commission, where she has “the capacity to see the big picture, think strategically, and communicate effectively,” said Frances Chapin, City of Edmonds Arts & Culture Manager. Courtney plays in her school’s orchestra, works with intellectually disabled students, and is the project manager of the Washington Association for Chinese Education. Erick moved to the United States from the Philippines in 2010. In only one semester, he was fluent enough to leave his English Language Learner classes and enrolled in AP and Honors classes. “Hayden does not content herself with the minimal science experiment or assignment, but instead probes the depth and the breadth of the assignment far beyond what she could be expected to do,” said her school counselor, Michelle Nilsen. For four years, Hayden has been a member of the United Diversity Club, and for two years was president of the club. “I am thrilled by the opportunity of being a bigger part of our society to contribute a puzzle piece of my viewpoint to accomplish the art of diversity together with our community for the better,” said Hayden. Jessica is exceptionally strong in math and science, but also pursues interests in humanitarian efforts, mentoring, anti-bullying, and working with teens. Jia has participated in competitive swimming, and has excelled in both academics and athletics. As an immigrant, she invited her new friends to experience her Chinese culture. Kayla Wheeler is a leader and role model, says her math teacher, Nancy Paine. “Her ability to grasp new concepts and integrate them into her other classes is in the top 5 percent of the students I’ve had over the last 13 years,” said Paine. Kayla is active on the school robotics team and the rocketry club. She helps the middle school theater class and is a national competitor on the U.S. Paralympics team. “She is very creative and curious,” said Paine. Strong in math, science, and technology, Paine “highly recommended” Kayla to any university, saying she has both the skills and integrity to succeed. “Kayla is a truly remarkable individual in so many ways,” her teacher said. Having a diverse society and world helps expand our thinking and knowledge, says Leonel Reyes, a senior at Sehome High School. “Diversity also provides our culture and society with unique and inspirational ideas and perspectives,” he added. Leonel participates in a community service project called Club de Lectura, in which he reads to and mentors elementary school children in their native language of Spanish. This in turn helps the younger students become better readers in English. Leonel is also learning French, has a 3.5 GPA, and is enrolling in AP classes. He is currently a Running Start student at Bellingham Technical College, where he is working on his prerequisites for entering the surgical tech program. Leta Ames participates in the Club de Lectura program, helping elementary students by reading to them and helping them with their literacy skills in English and Spanish. She is the “backbone” of the Unified Athletic Teams — uniting special education students with mainstream students. Leta discovered the value of diversity through a friend she met in the tutoring program. “Llanteo has demonstrated outstanding motivation and capacity for learning,” said Edwards. Monisha has immersed herself in the world of diversity that differs from most young people — she volunteered at Grancell Village Jewish Nursing Home. With her peers, she helped form an “Adopt a Grandparent” program. Monisha challenges herself with rigorous courses, plays tennis, and plays in the orchestra. She loves science, and wants to pursue a career in medicine. Nicola LaGuardia found one particular aspect of diversity almost accidentally — she joined the Unity Club, out of curiosity. The program unites disabled students with mainstream students in the pursuit of organized sports. “Until this point, I was unaware that some students did not have the opportunity that I had taken for granted,” she said. Nicola has been on the Debate team for four years and is its current president. She has served on the ASR (Associated Students of Roosevelt) for two years, and has been on the Key Club for four years. She was on the winning Roosevelt Dance team for two years. She’s been the Unity Club president for two years. Nicola has goals of attending a four-year college and majoring in chemical engineering. Her goal is to become an engineer. “In my estimation, her academic abilities and her outstanding personal qualities will make her a valuable member of the university community,” said her high school counselor, Dr. Littlebrave Beaston. “Oscar is a natural leader,” said Chief Sealth counselor Jol Raymond. “In the fall of each year, students are surveyed asking three questions: Who do you respect? Who do you admire? Who would you follow if they were leading? Oscar has consistently been listed by his peers in the top five students of our school,” said Raymond. Oscar was voted president of his freshman and sophomore classes, was selected for the student mentorship program, is a member of the Key Club, and was chosen to be in the school’s academy of finance program. Last year, he was one of five students selected as Student of the Year. “From what I have learned through my cross-cultural experiences of being both Zambian and American, along with my passion, drive, and compassion, I will strive to enhance the community and college I will be a part of and contribute to building a more diverse, humane, just, and sustainable world,” wrote Oscar. 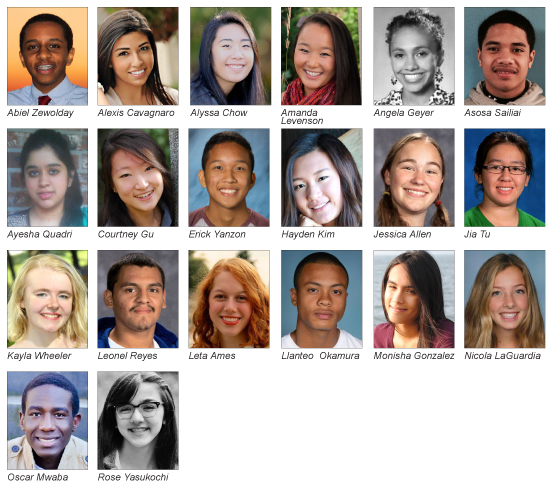 “Being biracial is an interesting experience, mostly because you’re stuck in a constant limbo between two very opposite worlds,” wrote Holy Names Academy senior Rose Yasukochi. Growing up in a multicultural household, her parents told her she could choose her religion. Her parents were involved with both Buddhism and Judaism. She chose Buddhism and has become involved with the Seattle Buddhist Temple in leadership roles and has gone through training to become a youth minister’s assistant. She also volunteers at Keiro Nursing Home. “During the course of her high school years, Rosie has proven to be an excellent leader, an outstanding student, a dedicated athlete, and a creative artist/musician,” said her college counselor, Alice Tanaka.